Before the clouds cover California again, before the winter showers begin and before the chilling breeze sets in; lets explore southern CA. Hollywood’s Universal Studios needs no introduction. Most of us have already been there or might be in the plans of going there. Just like we can’t judge a book by its cover, we need to visit every place more than once to absorb the feel and knowledge it scatters. 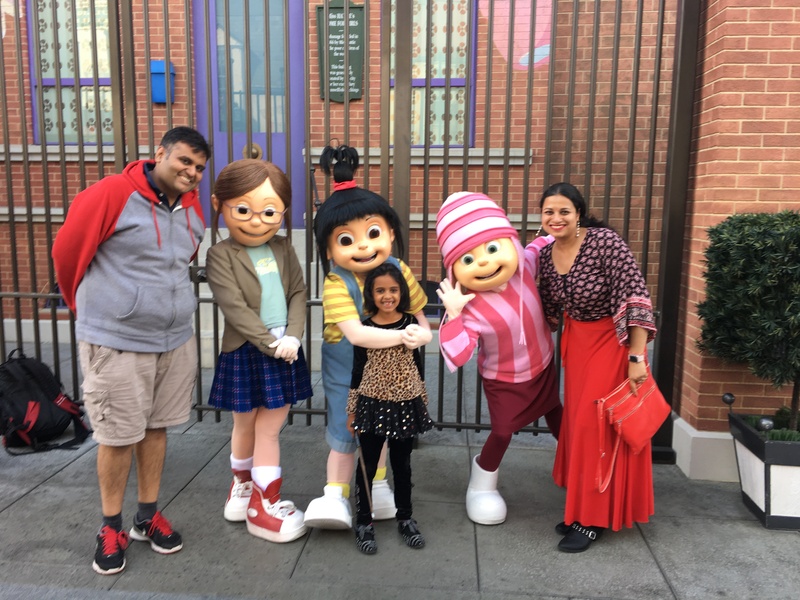 It was our second visit to Universal Studios of LA on the occasion of my hubby’s birthday. Followed by a short visit to Santa Barbara and Solvang the next day, this trip was exciting and relaxing at the same time. We started on Thursday evening from Bay area to reach Los Angeles around 11 pm in night. Usually booking a previous night hotel saves us our time and energy to enjoy the place on the D-day. So we just rested and enjoyed our home-cooked Kachoris ,Mawa cake and Naan-khatai on that day. Not to be missed shows include : The Underwater world and the Animal Actors show on the Upper Level. Special effects show is cool and the Walk-dead Attraction is frightening at the upper level. Kids’ rides like Simpsons coaster , Despicable Me , the Funny-land small rides are all enjoyable. Also don’t forget to click pictures of the striking mountains ,the entire city in the background while stepping down to the Lower level. 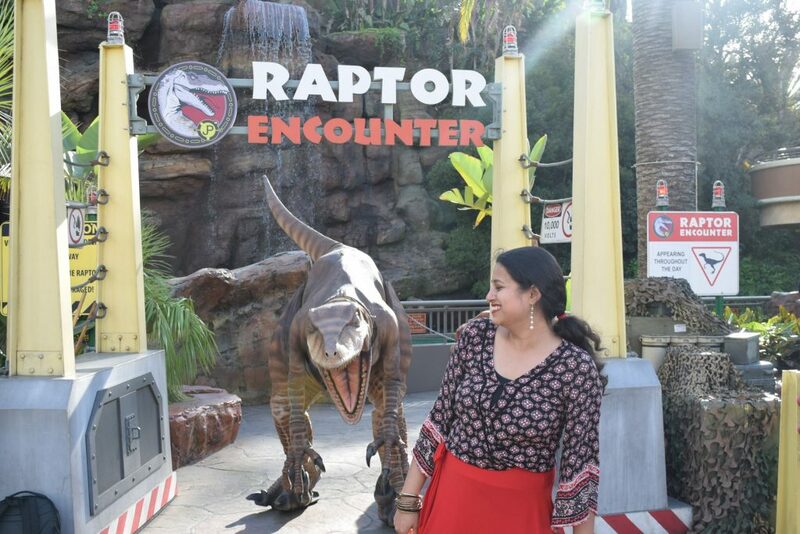 The lower level has the thrilling ” Jurassic Park” ride, the dark “Mummy” ride, the revengeful “Transformers” ride and a soft play area for kids – “Dino park”. It is good to choose a weekday for short wait times everywhere. Some rides like “Jurassic Park” is an ever-green adventurous ride ( P.S. : try to find the last corner seat for added adventure 😉 ). You will be tempted to ride again in them. 😀 . We ended our day in the Historic Citywalk of Universal Studios. It has all the components of a fancy City beginning from – The cafes, the restaurants, the shops to the Dancing Fountain, the Guitar,The Big screen, the King Kong , AMCs and the irresistible “Voodoo Donuts”. For more pics : Check “Universal Studios Album” !! Now after having all the chills and thrills, we needed some refreshing air . So we set out at 9:45 for Santa Barbara – a coastal scenic city. Luckily we found a decent Indian restaurant ( “Flavor of India”)there, where we ate our brunch. Santa barbara is a coastal town inhabited by the Chumash tribal people since the 19th century. They mainly lived on fishing and hunting. California was once the center of Gold rush ,so was this town. Santa barbara Museum of Natural History has beautifully preserved the city’s culture in various exhibits. It is an educational one-time experience with kids. street similar to the streets of San Francisco. loft parking for cars and our car was literally gliding on the wooden extended road, making a creaking sound (sometimes got to my nerves) while moving. To our amazement, a Pelican came and sat right in front of us for her photoshoot. She was fond of posing and getting clicked, it seems. People were busy fishing with rods and enjoying the sea-breeze there. It was a medium-crowded place with restaurants, cafes and shops. I found a few iconic sea pieces in a store and was tempted to buy them for my daughter’s sea-shell collection. The sea-hawks , the sea-gulls and other sea-birds flew fearlessly there. Day was about to end (at 3:30 )and we headed for Solvang – a small (4 mile ) Danish town called as the heart of Santa Barbara county. We reached the Visitor center of Solvang and did our first and the best experience of the city – the horse-cart ride. Rental bikes for families of 4 , of 10 etc were available too. But we opted for the guided tour in horse-cart across the whole city. In an half hour, our guide told us all about the town. Solvang was built by the Danish migrants in the 1920s but they had built it in an American style and as many as 50 families started living there. Later when tourists started flooding the city to visit and see the architecture, it was re-built and modelled on Danish lines. It is a gourmet hub of bakeries , desserts, ice-creams and wines. Windmills and mermaids are its icons. Tiny bird-house like things are actually Elves’ house. People in those days believed that keeping food and water for dwarfs and elves would bring good-luck and prosperity in their homes. Since the sun was going down, we went to Ostrichland straight after the ride. We fed the tall ostriches and the hungry emus there. One of the aggressive ostriches actually bit my daughter’s hand, so we were scared out of our wits. Don’t forget to extract an ostrich-embedded penny while leaving the place. Hans Christian Andersen Church is a holy ,quaint place to pay a visit. Our day ended in the beautifully lit town in “The little Mermaid ” restaraunt where we tried the famous Danish dessert – Aebleskiver in three flavors – Dulch De leche, chocolate and Home-made raspberry jam ; alongwith some burrito and rice. But if you have time you can pay a visit to the Elverhoj Museum of History and art, Solvang Vintage Motorcycle museum and the Wildling museum. You may also check for any events in the Solvang Festival theater– a 700 seat area. For More pics : Check Solvang ,Santa Barbara Album !! Overall ,this fun trip was packed with surprises ,thrills and soothing airs !! Hope you too plan a trip to LA and share your experience with me ! Till then keep roaming …. This entry was posted in Let's Explore and tagged Animals Actor show, chocolate, Chumash tribal people, Danish dessert- aebleskiver, Danish town, Despicables me 3, Dulch De leche, Hans Christian Church, Harry Potter rides, Historic Citywalk of Universal studios, Hogsmeade, Hogwarts, Itinerary, Jurassic park, Los Angeles, Mission Santa Barbara Church, Mummies, Ostrichland, Pelican, raspberry, Santa Barbara, Santa Barbara - beautiful water and Churches, Santa Barbara Museum of Natural History, sea-side, Solvang, Studio Tour, The big screen, The dancing fountain, The guitar, The king kong, Transformers, Underwater world, Universal city, Universal studios Itinerary, Voodoo Donuts.